Here is our food combining chart, you can see the list of foods for each food category at the end of this article. 1. The most important principle is to always keep fat separate from sweet fruit. There are many people including raw chefs who are ignoring this rule, telling us that they don’t have any bad reactions with that combination. Yes, you might not notice any reaction right away, especially if your eating habits where not so optimal recently. But you can be sure, that the fat-sweet fruit combination is affecting your body negatively every time, even if you don’t notice that at first. Why the fat-sweet fruit combination is not good for you? Firstly, sweet fruit digests much more rapidly than fat. Combining them together insures you will get a “traffic jam” in your belly. Result – fermentation with gas and alcohol production. This creates a toxic environment, which is perfect for the bad bacteria and harsh for your good bacteria. Another reason to avoid that combination is that fat traps sugar in the blood stream. Also, consumption of sugar releases insulin, but instead of getting and transporting sugar from the blood to muscles, brain, etc., insulin “grabs” fat and transports it into the fat storage. 2. Another important rule is to keep starchy, cruciferous and other slowly digesting vegetables away from fruit. The reason is the same as with the fat – slowly digesting veggies keep fruit in the “traffic jam”, causing fermentation and indigestion. Exceptions: sprinkle of the orange or grapefruit juice on the salad seems to be OK for many people, but it’s your responsibility to find out if you are one of them. Acidic veggies (non-sweet fruit) like tomatoes can go OK with mangoes for many people, but not for everybody. 3. Keep sweet fruit away from acidic fruit, like citrus, kiwis and sour berries. This combination also upsets digestion due to the different digestive juices needed for their digestion. Sweet fruit generally combines well with sub-acid fruit, like sweet apples, but again, you need to listen to your body and might avoid apple-banana or apple-date combination if you experience any discomfort after eating them. Sweet fruit also combines well with sweet pods like carob and mesquite. Acidic fruit usually combines very well with sub-acid fruit. And again, you should make sure it agrees with your body. 4. Keep fresh juices, watermelons and water separate from the other foods, because they are of the highest water content and they need to go through the stomach almost instantly and other foods would keep them in longer then needed and messing up the digestion. 5. Eat only one type of fat at a time. Fatty foods, like avocado, olives and especially nuts and seeds are hard to digest. If you give your body two types of fat, it is even harder for the body, lowering your energy levels and immune system. You might also get indigestion and gases from eating too much fat.As you can see, greens and herbs are generally combining good with most foods, but you should always listen to your body. If you feel heavy and gassy after combining greens with fruit, then you should keep them separate until your digestion becomes better or even for your whole life if you wish. Nothing is wrong about eating simple or even mono meals as long as you get all the essential nutrients from a big variety of fresh vegan foods.Fats combine well with greens and veggies and can help to absorb fat-soluble vitamins.Sprouts, spices and mushrooms combine best with veggies, greens and fats. They all digest pretty slowly, so give your body time after your salad meal before you eat fruit. Exact time depends on your personal physiology and health of digestive track. It can take anywhere from 3 up to 6 hour for some individuals. If you eat fruit 3-4 hours after a fatty meal and feel great with no discomfort or other symptoms like pimples, rashes, tiredness, blood sugar spikes and so on, you probably digested all your fats and they left your stomach before the fruit. Another good sign that a fatty salad is digested well is a real feeling of hunger. 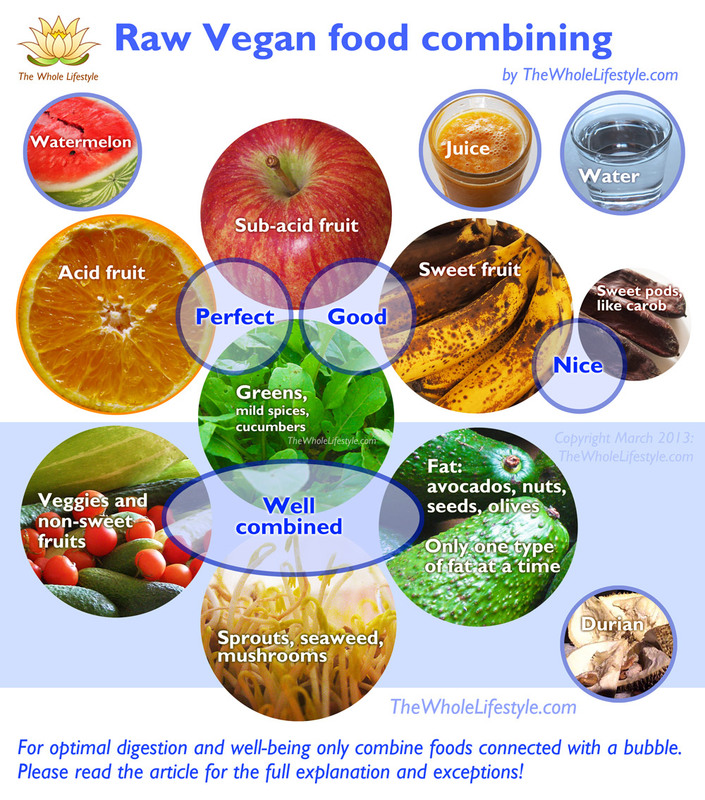 The good news is, you can improve your digestion by eating well combined raw vegan food and become more efficient at digesting and absorbing your food. Cucumbers and celery are a very neutral food and you can eat them like greens with almost any food. Durian is a very complex fruit – it contains both, fat and sugar along with certain enzymes to digest that combination . It should be eaten separately and not too often. We did not invent any of these rules, they where worked out for generations by health enthusiasts and natural healing practitioners. But all this is not written in stone, it’s just a guidance for you to find your own unique way to feel your best and feed your body in a way, that will allow to heal it as fully as humanely possible. Hi, I have just turned myself in for raw vegan diet. I have lost weight and already feeling positive changes but my only concern is of muscle gain, I have included nuts,seeds and sprouted grains . what else can I have or combine to get maximum muscle and strength gains. The main factor for muscle growth is intense exercise and getting enough calories. So get enough calories from sweet fruit and balance it with fat and veggies. Make sure to always soak your seeds and nuts, otherwise you will not be absorbing all this wonderful amino acids (protein). Unsoaked nuts are really harmful for your digestion. We would not recommend sprouted grains, especially gluten containing ones. Eat fruit and veggies instead. Don’t listen to the protein myth preachers. To get more amino acids (protein) add tons of greens to your fruit smoothies and you will be surprised with your results. Not only it will feed your muscles with best, most absorbable protein ever, but also noticeably reduce muscle soreness, allowing you to work out harder and longer. Good luck with your muscle building!